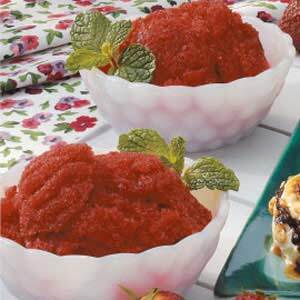 This Italian Ice recipe is sweetened with apple juice, making it so good and healthy. It is a family favorite. In a blender, combine the apple juice concentrate, lemon juice and strawberries; cover and process until blended. Pour into an ungreased 8-in. square dish. Cover and freeze for 1-1/2 to 2 hours or until partially set. Spoon into a large bowl; beat on medium speed for 1-1/2 minutes. Return to dish; freeze for 2-3 hours or until firm. Remove from the freezer 10 minutes before serving. Garnish with mint if desired. Yield: 5 servings.